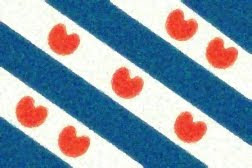 Fun With Frisian: STRIPFERHAAL - "comic"
Stripferhaal and tekenteltsje are two ways to say "comic" in Frisian. Stripferhaal begins with the long "ee" in "streak," a schwa in the second syllable, and an "ah" vowel like in "father" in the last syllable. [STREEP-fuhr-hahl] Strip [STREEP] by itself is another, short word for comic. Ferhaal means "story." Anyways, there is a reason for this particular lesson. If you enjoy Frisian and you enjoy comics, please check out my new sister-site, Fun With Frisian Comics. They are on Wordpress because it is slightly easier to work with images there and it makes sense to keep the strips separate anyways. You can share the comics, but please give credit back to the site.